The craft show circuit has begun and the tent and displays are standing in my garage, patiently waiting for the next adventure! It's been a year since I began this journey and I have more admiration than ever of the people whose livelihood depends on their determination and physical strength! 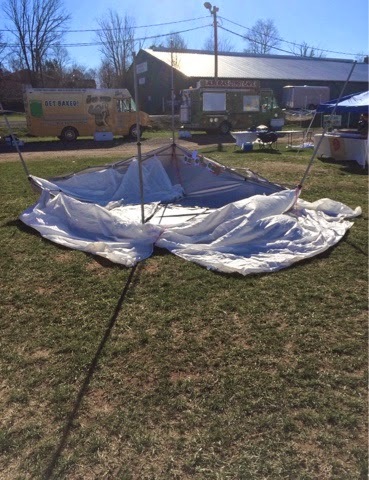 Last weekend, a big 2 day event, was exhausting, exhilarating and windy- the wind was not a friend- as seen by the dirt skid marks on the tiptop of my tent! As I arrived at the field for day 2, I approached my area with a bit of trepidation. The tables were tipped, papers, boxes and wares strewn about- my tent was no where near the spot I had left it the previous night! A lovely man helped me locate it 2 aisles over, helped flip it right side up and we carried it back to my spot! Not a calm relaxing way to begin but I was thankful for the fellow vendors help that am! So, if you are thinking about jumping on this craft show tour, remember that it's not a walk in the park. It's back breaking work, exhausting but definitely worth the trouble!